Brock Lesnar and his Summerslam opponents- Roman Reigns, Braun Strowman and Samoa Joe were all present in the same ring on the last Raw before the Pay per view takes place this Sunday. Roman Reigns was the last one to show up as he immediately went after Samoa Joe, hitting him with a spear. The Samoan Submission Machine had cost Reigns the Last Man Standing Match against Strowman. Strowman then took Reigns out with a running powerslam which meant that Strowman and Lesnar were left standing in the ring. Brock Lesnar is expected to lose the Title at Summerslam as he will be leaving WWE to focus on his UFC competitors. But still, when four of the most popular WWE superstars will be competing in a fatal 4 way match at Summerslam, the audience is likely to remain glued to their television sets. India’s Jinder Mahal will also be competing at the Pay Per View as he defends WWE Championship against Japanese wrestler, Shinsuke Nakamura. 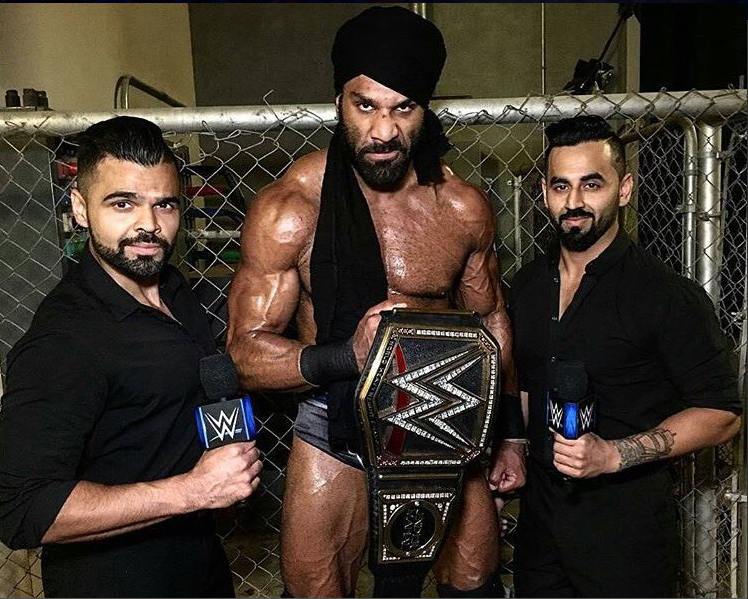 Mahal will be accompanied to the ring by the Singh brothers. WWE Summerslam: Can Lesnar and Mahal retain Title?